Director / Writer: John Keeyes / Cast: Debbie Rochon, Brandy Little, Johnny Sneed, Rebecca Stacey, Heather Haase, Kenyon Holmes, Robert McCollum, Kristin McCollum, Kimberly Deanne Morgan, Scott Phillips, Chris Ryan, Brinke Stevens, Hayden Tweedie. I was surprised by this Texas indie venture that takes the usual blueprint of all the post-Scream slasher films and bends it into an ambitious and intelligent variation. A group of twentysomething friends gather on Halloween at a Friends-style coffee house where they tune into the American Nightmare pirate radio station that invites listeners to call in and admit their deepest fears. Unknown to them, psychopathic ex-nurse Rochon is listening in and decides, for no particular reason, to kill them in the expected ironic styling. By complete coincidence, the nutty Nightingale slaughtered the sister of one of the gang the previous Halloween. 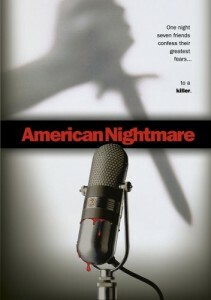 Instead of repetitive stalking and slaying according to whichever character’s fears, nurse from hell tempts final girl Jessie into a game of cat and mouse, promising the safe return of her other sister after offing only a couple of the others – one of whom is buried alive – and drugging a guy into stabbing his own girlfriend. One of Rochon’s better performances, she makes the best out of caustic dialogue (“Trisha’s dead? Bummer!”) with sufficient malice and even sets up a website to show off her handiwork called iamkillingyourfriends.com! Z-movie prop Stevens has a couple of lines as a mom whom Jessie babysits for, while the kid watches Halloween on TV. Things do fizzle out a little with a nonsensical conclusion that loses much of the tension but the intentions were good so its hard to write it off as a soulless cash-in. One curious thing: Rochon’s character is named Jane Toppan, who, I think, was in reality a murderous nurse…? Blurbs-of-interest: the Scream Queens Rochon and Stevens both appeared in Bleed; Rochon was also in Blood Relic, Final Examination and Head Cheerleader, Dead Cheerleader. Stevens was in Blood Reaper, The Cheerleader Massacre, Jack-O, The Slumber Party Massacre, Sigma Die!, and fleetingly in Fatal Games. John Keeyes later directed Fall Down Dead. This film continues to evade me. I want to see it even more now, thanks to the idea of an iamkillingyourfriends.com website!